The FC410MIO Multi I/O Module has three inputs and four low power outputs. The inputs can monitor external equipments and can be configured to monitor normally open or normally closed inputs. All four low power outputs can drive a self-powered high voltage relay HVR800. 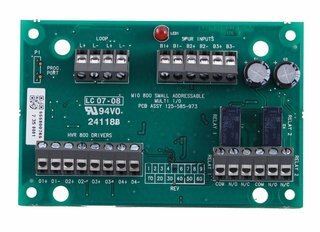 By disabling the low voltage outputs three and four, the outputs one and two can be used as volt-free relay changeover contacts (2 A @ 24 Vdc).